StationSpy sends you price change alerts for competing gas stations — so you can set your best price to maximize fuel profits! Viewing on your phone? Tap Here! No apps to install and no complicated web sites to visit. StationSpy is a simple text messaging service that works on any smartphone. StationSpy can send to you — or your managers — price change alerts for an unlimited number of locations. You can also use StationSpy to broadcast text messages to your station managers. Stop wasting time & money! 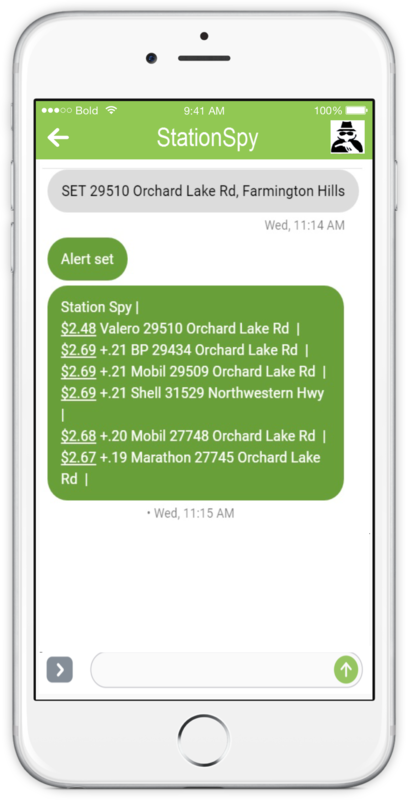 Let StationSpy send you text messages — automatically — whenever nearby gas prices change.